Your code is valid until . * I can cancel this agreement to receive informational mails at any time. My data shall not be transmitted to any third party. Do you have friends who are looking for an exceptional gift or just a special design object for themselves? Our customer's enthusiasm is nonplussing again and again. No matter if as gift for wedding, baptism, anniversary or just to record the XXL moments of life: your XXL Canvas Photo on frame is a very special present, which will beautify your home and inspire your guests and friends. Outstanding and unique decorativeness in sizes up to 63" x 47"! An eye-candy at home and for each guest. 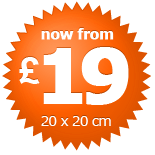 The XXL Canvas Photo is your personal digital photo printed on canvas in extra large size. After the printing, the canvas is carefully being wrapped over the edge of the stretchers and stapled on the reverse, so that as a result you get a final product that can be hung up at home as wall decor like a painting. My photo on canvas - what photo do I need? Printing a photo on canvas rescues nice pictures from the album, sparing them an existence in obscurity. Digital photos, in particular, live out their days on hard drives or memory chips. How do we get our favourite images as a photo on a canvas? The requirements for printing your personal photos on canvas are much lower than you probably think. Actually, there's no digital camera these days that couldn't produce a pictures unfit for printing as a canvas pictures. It's possible today to print digital photos on canvas in numerous formats and sizes. If you don't have a digital photo to hand, that's not a problem either. It's almost as simple to print photos on canvas from classic photo prints or slides. All that you need for a great photo on canvas is a scanner. If you would like to transform your favourite image into something quite special, canvas print is the procedure to be recommended. Canvas prints provides the means to transfer common photos from your digital camera into large scale works of art. All our canvas products are produced using a premium quality canvas printing procedure named "Thermal Colour Printing", which guarantees maximum brilliance, colour fastness, lifespan and environmental friendliness. Other obsolete print on canvas procedures are used on the market alongside this high quality procedure, for example canvas printing using DYE colours or thermal transfer printing. Find out more about how we use canvas prints to turn your photos into works of art. Make your digital photos larger than life. Printing your pictures as photo canvas allows you to create your own personal work of art in the blink of an eye for your home. Having your photo on canvas is as simple these days as having a copy of your photos done. We use standardised materials and technologies to ensure that the colours of your pictures on the photo canvas appear as natural as you would expect. Once printed, your photo canvas is then stretched onto a frame, providing you with a decorative object to keep and admire. Find out more here about canvas photos and printing photos on canvas. Anyone wanting to have canvas photo done will generally have high expectations of the picture. After all, photos printed on canvas are to be immortalised, photos that signify quite special moments for you. This is why we guarantee the highest standards in quality for you in bringing your digital photo on canvas perfectly. Excellent materials, production with attention to detail and perfect service allow us to provide guarantees for your canvas photo. As a rule, we produce your canvas photo within 24 hours. With our express service you will normally receive your order within 72 hours. No supplier delivers faster!